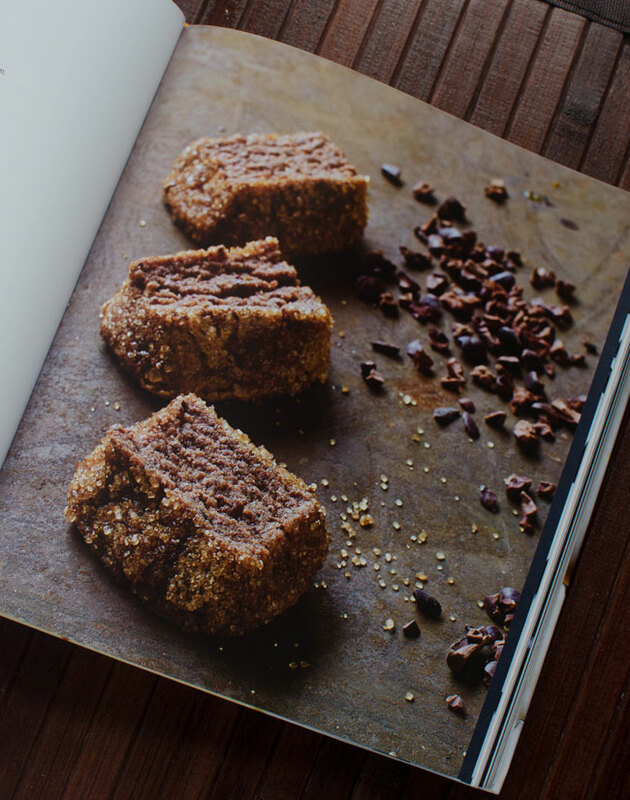 I am a bonafide lover of all baked goods, and when I saw this book I couldn’t wait to flip through its pages. 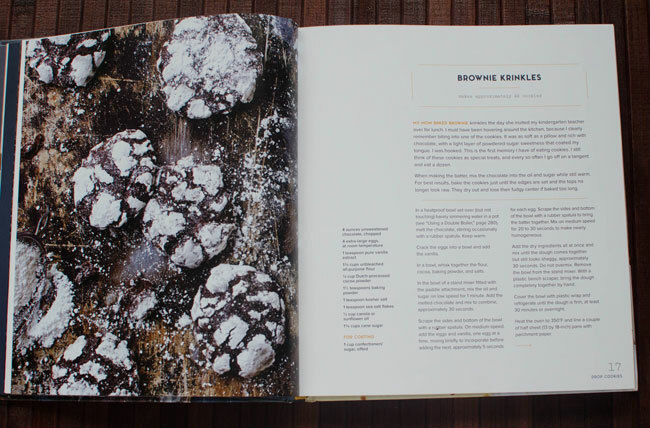 Cookie Love by Mindy Segal is a beautiful book full of gorgeous images of cookies. The book has plenty of delicious cookies to choose from, but it definitely has a more grown-up feel to it. While it has the obligatory chocolate chip cookie and snickerdoodles, there are also recipes for Smokey Bacon Candy Bar Cookies, Lemon Goat Butter Tea Cakes, and Whiskey Marshmallows. Overall, as far as cookie books go, it might not be the most kid-friendly, however there isn’t anything in here that I would love to try myself. As far as the recipes go, both of the cookies I’ve made so far (the Oatmeal Scotchies and the Brownie Krinkles) came out perfectly. I really loved the Oatmeal Scotchies*. We have a policy of sharing our cookies with friends and neighbors so we don’t overindulge ourselves, but I swear I could have eaten the whole batch myself if given the chance. Overall, I truly love having this book in my collection. These are the sort of cookies that are perfect when you’re out to impress, or really want something special to share. However, the ingredients lists on most of the cookies have enough specialty items that these are not going to be your everyday go-to cookies. There were several ingredients that I could not find at my local grocery store and had to order online. Perhaps you have a better-stocked store near you. If not, you may find the recipes more of a frustration than anything else. I tend to think the cookies are worth the extra effort for finding the specific ingredients listed. 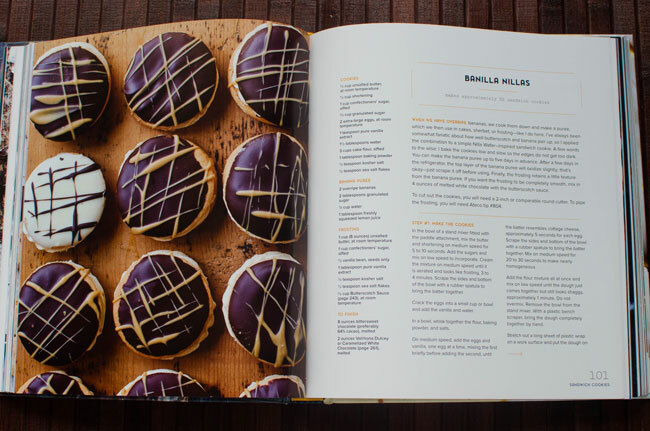 There are some truly special cookie recipes in this book and your taste buds will thank you. * If you want to give the Oatmeal Scotchies a test-run before buying the book, you can find the recipe on the publisher’s website by clicking on the “Read an Excerpt” button. I received this book for free from Blogging for Books in exchange for this review. All opinions expressed in my review are my own. It’s no wonder that Peanut Butter Blossom cookies are the favorite cookie of so many. Peanut butter and chocolate are old friends that go together perfectly. 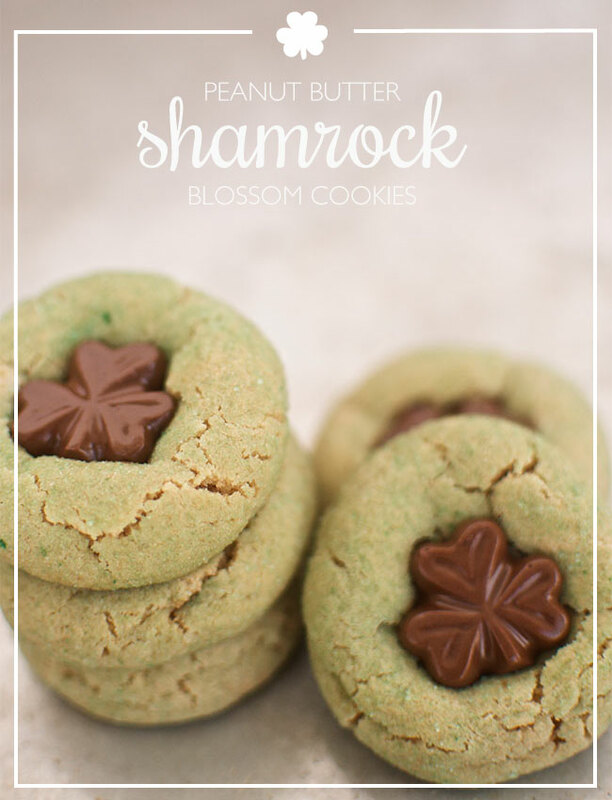 We decided to bring a St. Patrick’s Day twist to this delicious cookie by swapping the traditional Hershy’s Kiss with a shamrock-shaped chocolate and using green sugar on the outside of the cookie. These cookies are so easy to make, and the St. Patty’s Day elements only added a couple of extra steps. 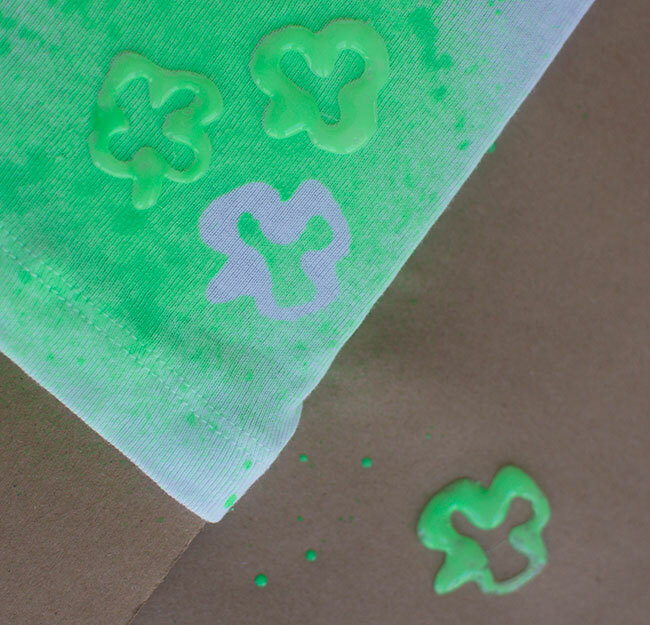 I used my shamrock chocolate candy mold to make the shamrock “blossom” centers, and I used dyed sugar to roll the dough in before baking. Have you ever dyed your sugar? Its pretty darn simple. Get your sugar, add a couple of drops of food coloring, and stir it (or shake it if you’re combining in a baggy). Keep adding additional dye or sugar until you get to your desired color. Cream together butter, peanut butter, brown sugar, and white sugar. Beat in eggs, one at a time, then add milk and vanilla extract. In a separate bowl, combine flour, salt, and baking soda. Add to peanut butter mixture, stirring all ingredients until well combined. Roll tablespoon of dough into a ball and roll in dyed sugar. Place dough balls about 2 inches apart on cookie sheet. Remove from oven and immediately press chocolate shamrock candies into cookies. Allow to cool completely so shamrock cookies can re-harden. Keep the chocolate candies frozen until you are ready to add them to the cookies. This will help them hold their shape better while handling. I’ve tried quite a few techniques for altering fabric: stamping, dying, freezer-paper stenciling, etc. As soon as I learned about glue gun stenciling I knew I had to try my hand at it. 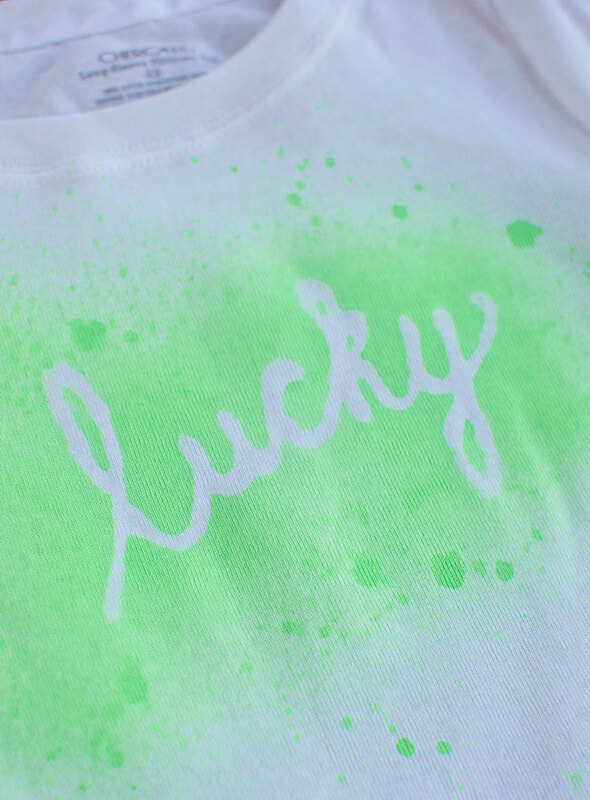 And, since green isn’t really a color my girls tend to have in their wardrobe, it seemed like a St. Patty’s day shirt would be the perfect project to give it a go. Use wax paper. I tried gluing my design onto wax paper, aluminum foil, freezer paper, and a glass plate to see which one would allow the glue to come up the easiest and the cleanest. The wax paper was the easiest to get the glue off of. 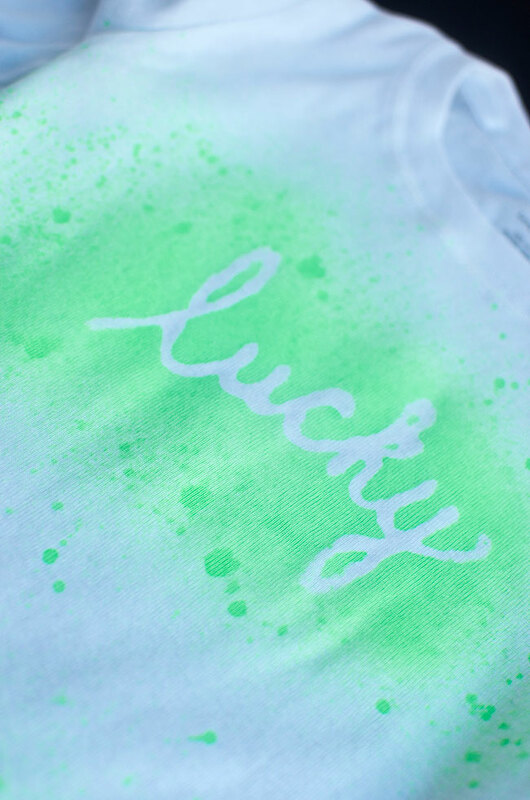 Plus, it has the added benefit of being see-through so you can place a piece of paper under the wax paper with your design on it and trace over it with the glue gun. Spray a little Pam. Even with the wax paper, the glue was difficult to get completely off of the paper. When I sprayed a little bit of cooking spray on the wax paper, the stencil was a breeze to get off. 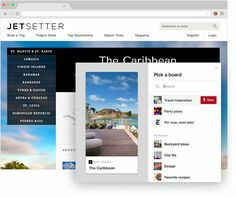 So, not only is it cleaner, but you’re more likely to maintain the integrity of your design. Keep your glue thick. If your design allows it, you’ll have a much easier time if you can maintain a good thick stream of glue from your glue gun. I wasn’t sure which fabric spray to go with, so I picked up both and I’m so glad I did. 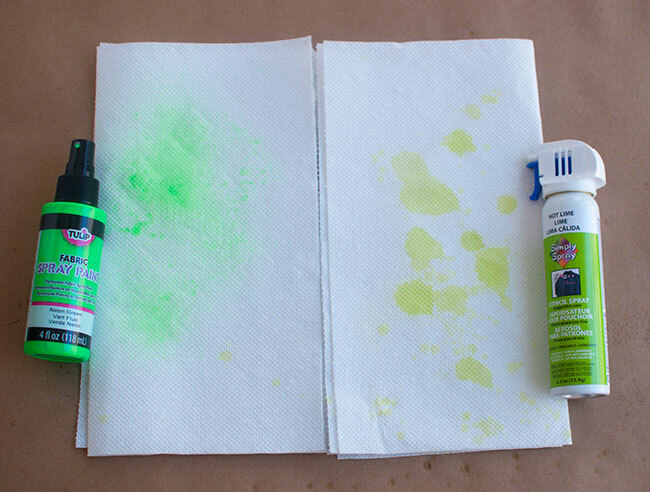 On the left is the Tulip Fabric Spray Paint , and on the right is the Simply Spray Stencil Spray . The Tulip fabric spray was by far the better fabric spray paint. For one thing, it sprayed better. Unfortunately, the Simply Spray would only come out in huge drops and everything you see on the paper towel is all I could get out of it. It actually stopped working at this point. I read the directions, but there’s always the possibility of user-error, so I’m not quite ready to throw Simply Spray under the bus. In any case, I went with the Tulip spray paint. The glue gun stencils came off very easily with not sticking or unwanted marks left behind. I used cardboard between the layers of the shirts to make sure no paint went through to the other side. 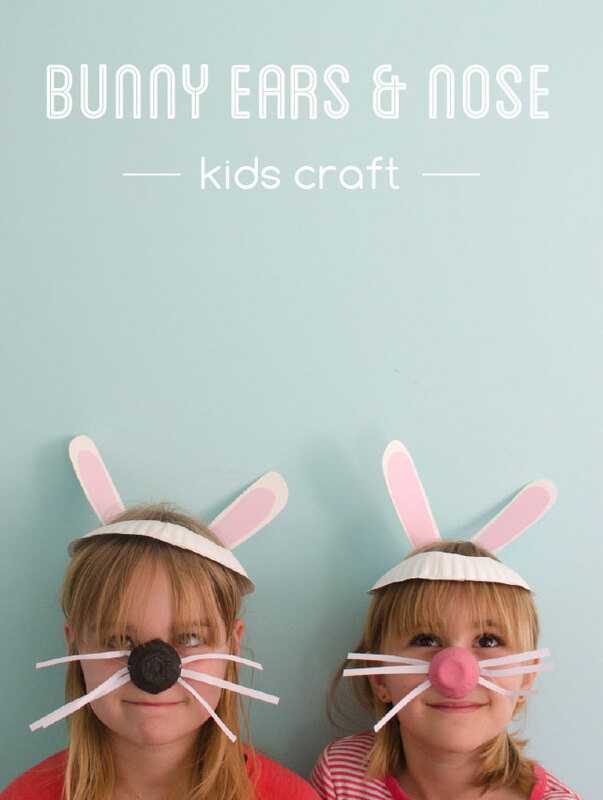 You could also use poster board, or even freezer paper. Anything flat and mostly impermeable. 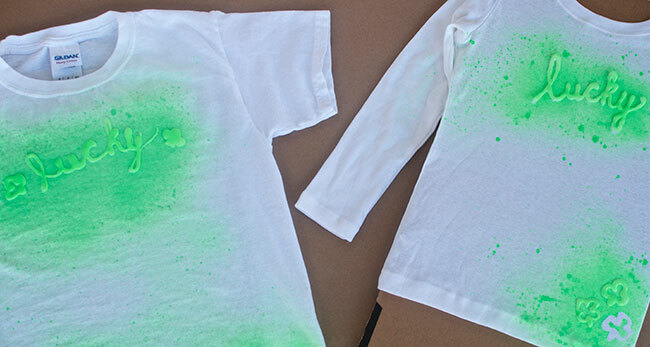 It didn’t take long for the shirts to dry and they were easy and fun enough that I’ll likely use them with the kids next time. 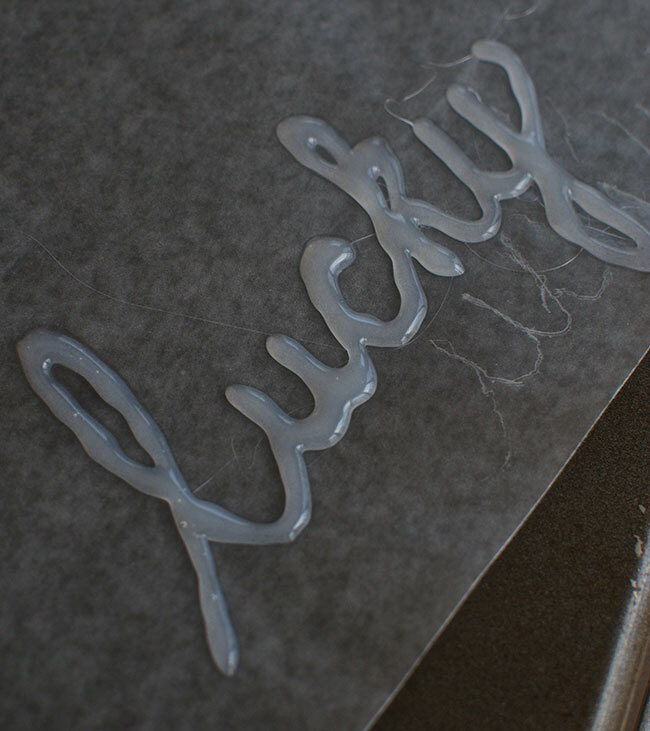 What do you think about the glue gun stencil? Have you tried this process before? If anybody has any extra tips they’d like to share I’d love to hear them! 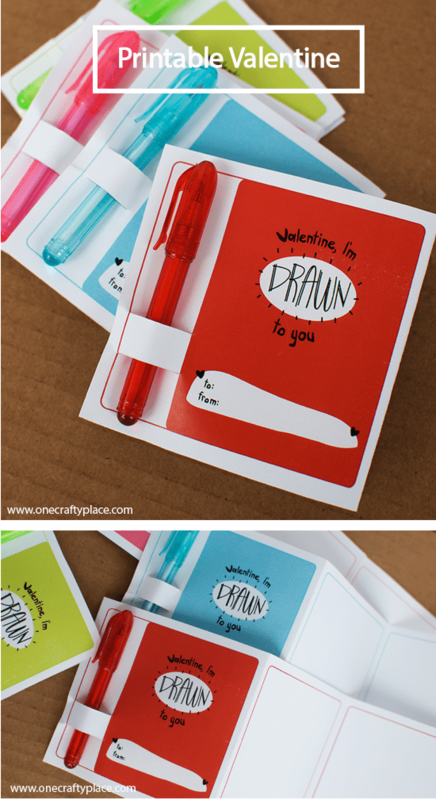 I love the idea of a multi-purpose Valentine that won’t just be eaten and forgotten about. When I was thinking about making these printable Valentines I knew I wanted to provide a little pencil or pen, plus some space for drawing. I think it would be really fun for the giver to include a special sketch for his or her friends, or maybe they could even collaborate on something together! The drawing squares are the perfect size for a kid-made comic strip. These would accommodate any smallish pencil or pen (golf pencils?). I picked up the pint-sized pens used in mine at Walmart in bags of 12 for $2. Please enjoy these free printable Valentines offered in 4 colors: Red, Pink, Green, Blue.